This stainless steel canister (now available in two sizes) is the ultimate in loose leaf tea storage! 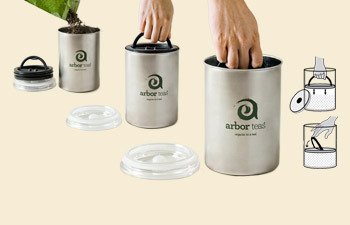 Super simple, yet sophisticated, it keeps your tea away from harmful air, light and moisture. The 18/8 restaurant-grade stainless steel body resists staining and the transfer of odor and flavor. The interior (black) lid acts as a plunger that has a patented, one-way valve to expel air from the container and locks closed to keep air out for ultimate freshness. In fact, the plunger is so effective you can hear the air escaping from the storage canister as you depress the plunger. The exterior (clear) lid allows you to peek at how much space remains inside the canister. Added bonus - they are easily stackable to save you counter space! The small storage canister comfortably fits any of our regular-sized organic teas and herbs and the large storage canister fits any of our bulk sizes. 1) Transfer. Transfer your tea to the storage canister. Don’t forget to transfer your white Arbor Teas label too! 2) Plunge. Place the black lid on top of the storage container and flip up the handle. With the handle raised, slowly push down. You will hear air escaping from the canister as you plunge downward. Stop when you hear the crinkle of tea leaves! To prevent your tea leaves from crushing, do not depress the black lid too low. 3) Seal. Close the valve on the black lid by flipping down the handle. Finally, place the clear lid on top. Top shelf dishwasher safe. Both lids are BPA-free.